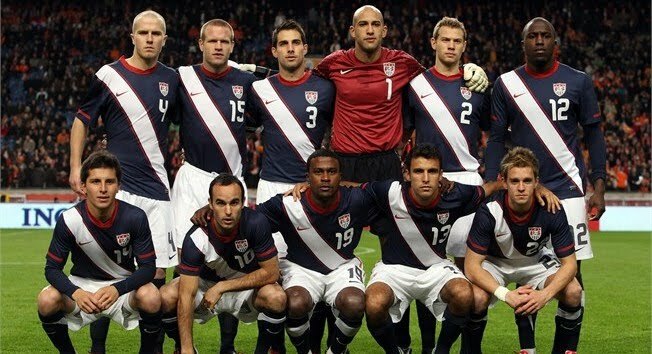 The US came from behind to defeat Turkey by 2-1 in front of 55,000 at Philadelphia's Lincoln Financial Field. This was supposed to be a match for the starters. Kljestan, Bedoya, Ching, Rogers, Pearce and Johnson had all been dropped since Wednesday. It was time to see who would start in the back. Would it be Bornstein on the left and Onyewu returning to the central position? What about the midfield? Clark or Edu? Torres or Feilahber? And who do we pair with Altidore? A surprising formation from Bob Bradley with a 4-5-1 with Altidore alone up top and a withdrawn Dempsey right behind him. Feilhaber and Donovan also roaming from mid to forward. Clark and Michael Bradley cleaning up the middle. Bocanegra at left back (expect to see him there in two weeks), Goodson and DeMerrit in the middle and Spector at right back. It didn't work. Howard was furious with his defenders, including Spector, whose incursion forward generated a Turkish counter that opened the score in their favor. Yes, Spector's place should have been covered by Clark. But the team looked shaky for most of the first half and, if it wasn't for Howard, could have been down by a lot more. Enter Findley fro Feilaber, Torres for Clark, Onyewu for Goodson and Cherundolo for Spector. New team. New attitude. Dempsey retreats to a diamond formation center midfield/forward, Findley roams around as a second striker, Torres defends and attacks alongside Bradley and the back line is solidified. What follows is ball possession for the Americans and scores by two of its prominent strikers: Dempsey and Altidore. Dempsey got to play like he sometimes does with Fulham. Donovan drifted forward also, providing assists on both tallies. Torres feeds Donovan, Dempsey and Findley. Findley's inclusion in this team was quite a surprise for US followers, including myself. Yesterday he showed us why Bradley picked him. He adds spark and speed late in the game when it's needed. He isn't worried about scoring as a starting forward. He and Gomez make excellent supersubs. Holden is another great option on the left flank, as is Beasley. You have to wonder what will happen with the forward position. Out of this came we have two probable changes: Edu for Clark and Torres/Beasley/Holden for Feilhaber. Expect Cherundolo to take over the right back position. Onyewu may take over for Goodson. Buddle may get the nod up top with Jozy. Australia is a worthy opponent and the next game is in South Africa, on neutral ground, and a week before the US debuts against England. A last chance to see our probable starters for the World Cup. Serbia is a difficult subject to tackle. Its geopolitical history complicates its football history...even in my own memories. Should I treat them as the former Yugoslavia and group all the great things that former soccer nation accomplished? For the time being, and in this blog, I will simply point to past achievements. The Yugoslavia national football team represented the Kingdom of Yugoslavia (1920–1941) and the Socialist Federal Republic of Yugoslavia. Despite the break-up of the former Yugoslavia, remnants of its history offer a rich background full of impressive achievements. These include 8 World Cup appearances and two fourth place finishes in 1930 and 1962. Yugoslavia split, of course, in the early 1990s. From it came Croatia, Macedonia, Slovenia, Bosnia and Serbia & Montenegro. The latter were included took part in qualifying for the last World Cup, prior to Montenegro's independence. Through the 1998 tournament and Euro 2000, the name of Yugoslavia stuck with the team. And this is where we begin the memories. France '98 was the year Yugoslavia was considered a dark horse contender for the title. Names such as Mihajlovic, Jugovic and Komlejenovic still ring in Euro club lore. The Yugoslavs played against Germany, Iran and the US in their group. They defeated the lower-seeded USA and Iran teams by 1-0 and tied the German's in a heartbreaker, where the Germans erased the 0-2 score thanks to a Mihajlovic own goal and a Bierhoff score 10 minutes from the 90 minute mark. What followed was a game against the Dutch, having lost first place in the group phase to Germany. Holland posed a much more dangerous opponent and although the match was 1-1 and headed for extra time, another late-game score, this time by Edgar Davids, was enough to finish their stay in the tournament. Yugoslavia (still using this name) would miss out on 2002 due to the political turmoil and its spillover onto football. As Serbia & Montenegro, the Serbs finally returned to action in a World Cup in 2006. They had qualified with an unbeaten record and ahead of always-favorite Spain. Their group was that tournament's "group of death" with Argentina, Netherlands, Cote d'Ivoire. An injury to their major star, Petkovic, and the ensuing controversy surrounding his replacement (the coach's son, Dusan, who later withdrew due to pressure from the public/media) meant a mentally-weakened squad. They lost their first game against Holland, were destroyed by Argentina (6-0) , and subsequently failed to defeat Didier Drogba's Ivorian side. What's next for Serbia? Germany, Australia and Ghana. Worthy foes in another "group of death." I can see them finishing in second place but competition for this spot will depend on their score against Germany and wins against the other two teams. Look out for stars like Stojkovic (Wigan), Vidic (Manchester United), Subotic (Borussia Dortmund), Stankovic (Inter), Ivanovic (Chelsea), Lazovic (Zenit St. Petersburg) and Zigic (Birmingham). A few thoughts. Most of the players on the roster we knew were going to be there... the Donovans, Altidores, Dempseys and Howards. Beasley's inclusion is no surprise given his recent form with the national team, if not necessarily with his club. It's also good to have Goodson, especially given DeMerrit and Onyewu's recent injuries. He showed great poise versus Czech yesterday. It came down to fringe players, forwards and the crowded midfield. I'm surprised by the inclusion of Findley, but Bob's comments lead me to believe that he has a plan for the Real Salt Lake attacker. His inclusion also meant Bedoya was out as a surplus midfielder. This is more evident by the resurgence of Beasley and the rise of Holden. Another surprise, so to speak, is Buddle. He showed yesterday that he can play at the highest level and he has been accurate and constant for the galaxy (9 goals in 9 games). This came at the cost of losing Brian Ching, the veteran of 2006 and an important figure in the offense. Ching was about possession, drawing fouls and opportunism. All important qualities that Bob feels Buddle can bring. Herculez Gomez's presence is less of a surprise and more of a relief. The top scorer in the Mexican League with a mid-table team and as a substitute is not someone we can afford to overlook. He showed why this is so with his tying goal against Czech. 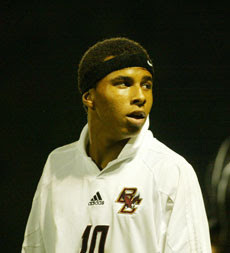 It was a tough pill to swallow for some of the players, like Ching, Bedoya, Kljestan, Rogers, and even Charlie Davies. Also a great sense of renewal with Buddle, Gomez, Findley. This turnover also includes Altidore, Howard, Spector, Holden, Edu, Bradley, Clark, Torres, Guzan, DeMerrit. Add to that World Cup veterans Donovan, Dempsey, Hahnemann, Onyewu, Bocanegra and Goodson and you have the best the USA has to offer at the moment. Lots of fresh faces, intrigue, experience and drive. Good luck and enjoy the games, for they only come around every 4 years. Guzan: Very rusty, and it showed at times. He also showed why he's on the team. Quick saves and good positioning. Onyewu: Was at fault for the first Czech goal, looked rusty at times but very good on the ground. May not start in South Africa but in the 23. Bornstein: Speedy recovery in plays but many errors that caused trouble for the defense. In 23, could be replaced by Pearce/Bocanegra/Spector. Goodson: Excellent game for the central defender. Assisted on Gomez's goal. In 23, may start ahead of Onyewu/DeMerrit. Pearce: His play was weak tonight and didn't outdo Bornstein. Good going forward. Not in 23. Cherundolo: Beaten in Czech's second goal. A bit lost at times but had generally good positioning throughout the match and very good going forward. In 23, Spector may get the nod ahead of him at right back. Edu: Opportunistic goal, his new trademark. He was steady and dangerous in the midfield and broke up play by the opossing team. The 4th goal was his fault. Not a great switch to D. In 23, starter alongside Bradley. Holden: Excellent match. Assisted on the first goal. His crosses were great. His defensive play could improve, however. In 23, probably a supersub or interchangeable with Dempsey. Beasley: This was the Beasley we all know and remember. Quickly to the attack and defense, great passing. In 23, supersub and/or interchangeable with Donovan. Torres: Had a quiet night but impressed enough to remain in the team. In 23, substitute mainly. Sacha Kljestan: Not a bad night, but he's still behind many others in the initial 30. Not in 23. Alejandro Bedoya: Not very effective and this may have cost him the trip to the World Cup. Pearce's faults could put him into the 23. Robbie Rogers: Lively and speedy but not enough to replace others in the squad. Not in 23. Edson Buddle: Worked hard but was unlucky going forward. Could make 23 in favor of Johnson/Gomez/Bedoya. 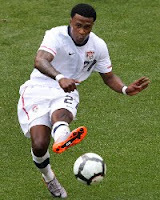 Eddie Johnson: A bit more effective than Buddle. His play set up Edu's goal in the first half. Could make the 23 in favor of Buddle/Gomez/Bedoya. Herculez Gomez: Golazo! Always dangerous but needed to pass the ball better. A great supersub in South Africa. In 23 unless Pearce/Bedoya/Johnson combination doesn't work for him. Brian Ching: Possession and experience. In 23 and could start along with Donovan/Altidore/Dempsey. The 4-2 score is tough to swallow. Treat this as a pre-season withouth the starters. However, about 3 or 4 that played tonight might actually start in the World Cup. Tonight was about showing us who can still cut it and who has lost their chance. Gomez, Beasley, Holden, Edu and Goodson stepped up. In any case, we'll learn tomorrow who will actually go to South Africa. Saturday will showcase more, if not all of the starters. Apologies for the long delay. This sort of delay may go through most of the season this season due to other commitments. Do expect analysis on at least a bi-weekly level. In this post we review weeks 7-10. 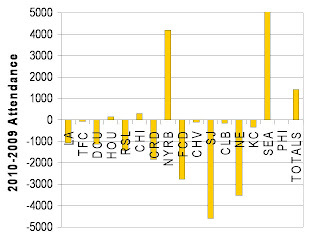 Much has happened since the last MLS attendance post for week 6. Philly has played again in front of a sizable crowd at Lincoln Financial Field (28,000 aproximately). Seattle keeps on selling out 35K+, albeit still beaten at home to teams like LA and San Jose. Dallas is drawing slightly larger crowds and barely outside the 4-digit realm. New England is also weak. Above we present a high-res view at changes in average attendance from 2009 to 2010. New York is a big winner, even if they haven't sold out their brand-new Red Bull Arena. Expect this place to be rocking once Thierry Henry comes to town after the World Cup. Australia is an odd bird in the football community. They boast talented players, an interesting league set against other major sports (much like the MLS), and a unique location. Perennial representatives of the Oceania Football Confederation, they were always playing playoff matches to enter the tournament. Sometimes with Asia, sometimes with South America, one time even with Israel. Almost never enough to get through except for 1970. Germany 2006 was the first time in 36 years. 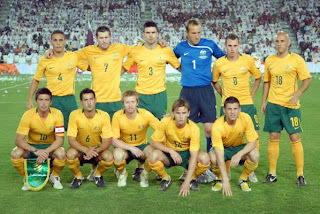 Australia was just recently (2005) admitted to the Asian Football Conference (AFC), thus ending decades of relegation to playoffs. They certainly benefited from this and qualified for South Africa without losing a single match to AFC opponents. In truth, aside from my wanting the Aussies to be in a World Cup to make it truly global, 2006 was my only experience and only memory of the team. They were pitted against Croatia, Japan and eternal-favorites Brazil. Guus Hiddink coached the squad in the World Cup and, true to his nature, took the team to the next level--the second round. Granted, my memories of 2006 are limited to the fact that I was traveling much of the time (even though I still watched 80% of the games). Still, their win over Japan and a well-deserved tie versus Croatia were enough to see them through to the round of 16. A loss by 2-0 to Brazil was not unexpected. Australia probably deserved better fate against Italy in the second round. They held the eventual-champions 0-0 until injury time. A fateful penalty taken by none-other than Francesco Totti ended the Socceroos run in 2006. What's next for Australia? A group of death, of sorts. First there's Germany and, considering their squad, almost assured a place in the next round. Then there's Serbia, always dangerous and with a storied past. Lastly, there's Ghana, one of the more dangerous of the African sides in this tournament. Australia has quite a squad, though, and should go head to head with all the teams in this group. Some stars include: Mark Shwarzer (Fulham), Lucas Neil (Galatasaray), Wilkshire (Dynamo Moscow), Lowry (Aston Villa), Mark Bresciano (Palermo), Mark Grella (Blackburn Rovers), Tim Cahill (Everton) and Harry Kewell (Galatasaray). It's Milan. 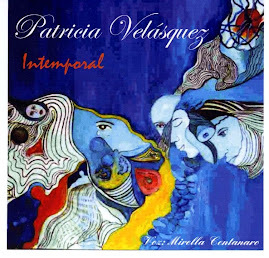 Milito. Mourinho. It's Serie A. Coppa Italia. UEFA Champions League. It's twice the treble and a second year in a row after Barcelona's last year. Inter Milan was the better side today and was victorious over Bayern Munich by the score of 2-0. They were the best in Europe, eliminating Chelsea and Barcelona. Mourinho is still the Special One and always will be. Will he stay put in Milano or will he go to Madrid? Milito was the man today. Undoubtedly playing the best soccer of his career and, hopefully, also in the World Cup. Sneijder was a menace in midfield and Eto'o was so close so many times. Lucio, Cambiasso, Zanetti and Chivo held their own in the back. Julio Cesar was impeccable and probably saved the game on at least three occasions. Maicon and Pandev were steady. Let's not forget Bayern Munich. They were a worthy side and Muller could have tied it early in the second half. That would have surely changed the game. There was also a Chivu handball in the area during the start of the game. Could this have changed the outcome of the match? Luis van Gaal's side is young and a force to be reckoned with from here on out. Ribery will return next season. How could he have affected this game? In the end it was an awesome match. A special game for a special team. A special striker scoring for a special coach. A special coverage by Fox, on national television, in English, for the first time for a European soccer match of this magnitude. America is waking up to soccer. Let's see what happens next month. Cheers, Inter. You are the best team in the world. Cheers, Mourinho. You are the best coach in the world. Cheers, Milito. You are playing the best soccer of your career. Yes, no Charlie Davies. No matter how much or how hard he tried, his injuries were still not healed enough for him to be considered a viable option for this summer's World Cup. No Freddy Adu either; he hasn't shown enough consistency. Conor Casey's absence is intriguing given erratic Findley, but we must consider the element of speed that Davies once brought. Goalkeepers: Howard the undoubted starter. Hannehman is the best runner-up. Guzan has seen only limited time on the pitch and serves as a good third option. Defenders: Onyewu's inclusion provides hope that he may be healthy in time for the tournament. He has already been practicing fully with AC Milan. Chad Marshall is a question mark given his inconsistencies with the nats. Same goes for Pearce but his stock has risen some since moving to Dallas. Bocanegra is captain America and will start. Spector and Cherundolo will battle for right back but Spector could also play left back. That leaves Goodson, Jay DeMerrit and Bornstein. Expect the former two to battle it out with Marshall for the final spot. Bornstein is a natural, albeit streaky, left back, and a suitable option. Midfield: Donovan and Dempsey are automatic starters. You can say the same for Michael Bradley, who saw a consistent season in Germany with his club. Maurice Edu probably leapfrogs Clark for the second defensive mid given his performances with Rangers. The remaining top options for the final 23 are Bedoya, Holden, Torres and Feilhaber. All are dominant players seeing time with their European squads. I'm not too keen on Rogers at the moment. Beasley is also a tough call given his lack of playing time the last few months. Kljestan's inclusion is interesting and he may be peaking just in time, given his performance with Chivas. Up top is an undoubted starter: Altidore. Who to pair him with is the question. Ching? A veteran that can hold the ball but was ineffective versus Mexico at the Azteca. Findley? He has the speed but his touch is missing with the national team. Johnson? Good option given his results with Aris and consistent scoring. He also has speed, albeit not as impressive. Buddle and Gomez are big question marks. They are both incredibly hot with their clubs as top scorers in MLS (Buddle) and the Mexican Primer (Gomez). I expect Findley to be dropped. Ching may remain but if he doesn't it may be Buddle or Gomez that makes it in. Tough decision indeed. We'll see better options in the next few days as Bradley releases some of the players to remain with just 26-28 at Princeton as the team starts pre-tournament training. I heard it from family members more than once: "I don't know if it's the World Cup without Ecuador in it." Yes, that's because he's seven years younger and last time Ecuador failed to make the tournament was in 1998, with elimination in 1997. That would have made him about 11. And if you're not a big fan at that age, things will just not register. So yes, an absence indeed. For two qualifying cycles, Ecuador lit it up in Conmebol, taking down worthy foes like Brazil, Paraguay and Argentina and defending its home turf at the Atahualpa. They did not lose once at home for the 2006 campaign. Long gone are the days of Aguinaga (best Ecuador player in the 90s), Agustin "el Tin" Delgado (9 tallies, tied for first in Conmebol for 2002), Alfonso Obregon, and Ivan Kaviedes. One of my favorite players, Kaviedes was also a pioneer for Ecuador, playing in Italy, Spain and England. 2006 was his second World Cup after an ineffective 2002. He was a supersub and didn't disappoint himself with a sublime strike in Ecuador's 3-0 win over Costa Rica. It was also a memorable celebration, and one of the top 50 for FIFA. Figures have been updated through week 6. You will notice a dip in TFC attendance (below 20K?!). Not by much, but certainly bogs down on their differential from last season. RSL also had a poor showing and has lost its edge. DCU is understandable given their poor form... Too bad ESPN has to cover them (another weak attendance showing on national TV... when will they learn?!). 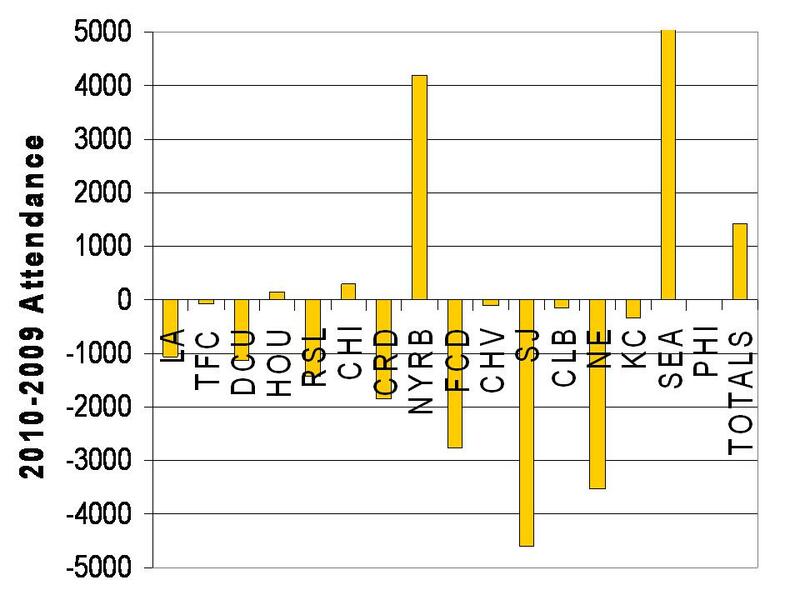 If it weren't for Seattle and Philly's inflated opening match game we may have the same or even lower average attendance compared with last year's. Keep in mind that we average not the games, but each team's average of their own games. This filters out some of the noise. New York remains strong, despite their less-than-stellar numbers (about 15k+ at their last home game). Anything is better than last year's numbers... on and off the field. Germany is another classic team. Winner of 3 World Cups in Switzerland 1954, Germany 1974, and Italia 1990, as well as champions in the Euros in 1972, 1980 and 1996. Of course, when we speak of Germany we also remind ourselves that there were once two--East and West. And yes, as with everything else, they both had teams. However, did you know there was a third? That's right, Saarland, briefly a separate state after World War II, and, also briefly, a national team. There are many famous names that go along with the Germans: Gerd Muller (top scorer in '74), the Kaiser Franz Beckenbaue, Bayern Munich CEO Rummeniegge, the iconic Lothar Matthaus, Juergen Klinsmann, Thomas Hassler, Andreas Brehme, the list goes on. Even Berti Vogts makes the list for me... Why? It just so happens that I went to a German school during my elementary school and part of Middle school. I thus had a soft spot for the team and cheered for them against Argentina (and pretty much everyone else in my family) in 1986 and 1990. So this is where my memories begin... Mexico '86. Really I mostly remember the final, although images of the Mexico-Germany game remain as flashes. I also knew they had defeated another personal favorite, France, in the semifinals. But it's the final that really sealed the deal. This was Maradona's Argentina and Maradona's tournament. He would prove it not by scoring the goals, but by orchestrating play and drawing defenders to leave team mates such as Valdano and Burruchaga, open. The game started with a 1-0 in favor of the south Americans after Brown scored in the 23rd. Valdano increased the lead in the 55th but Germany roared back with tallies by Rummeniegge and Voller. The latter occurred in the 80th. Burruchaga would score in the 83rd in an amazing breakaway that still aches in Germans' minds. But Germany would have revenge. If Argentina could be considered the "Rocky" of '86, then Germany would undoubtedly be the "Ivan Drago" of 1990. Not evil, no. Just a steady, powerful machine that got their result game after game. It would start with a thrashing of then-unified Yugoslavia (4-1). Klinsmann, Matthaus and Voller all scored. They followed with a resounding 5-1 victory over lowly United Arab Emirates. Having mathematically secured their place in the round of 16, their game against Colombia didn't matter as much. This was welcomed by the "cafeteros" and the resulting score was 1-1. An epic game unfolded in the next phase against a worthy opponent--Holland. The Germans would prevail (2-1). In the quarterfinals, it would be Czechoslovakia's turn. Lothar Matthaus delivered a penalty early in the first half and the score would stand. In the semifinals, another battle took place. It was England (with Gary Lineker). This had to be one of my favorite games. Brehme would score half-way through the second half, much to my amusement. Lineker would show his magic again in the 80th minute, tying the score and sending it into added time. Without a score in a gritty, dirty half hour of extra time, the game ultimately came down to penalties. Yes. Oh, the agony! 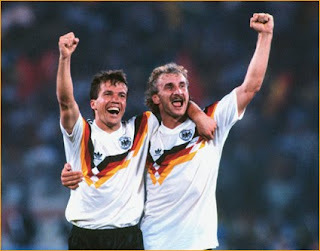 Brehme, Matthaus and Riedle would score... so would Lineker, Beardsley and Platt. Pearce and waddle would miss. Oliver Thon sent Germany to its third consecutive World Cup final. The final of 1990 was another special occasion. It was a repeat of 1986, but this time in Europe. There is a rule, only broken by Pele, that when a tournament is played in Europe, the winners are the Europeans. South Americans rule in the Americas (and Asia, where Brazil won). Unlike in Mexico, Maradona wasn't as dominant a player in 1990 and was actually playing while injured in the final. The match was back-and-forth with emotions running high. So high, in fact, that a questionable penalty was awarded to Germany. This time, however, it wasn't Lothar Matthaus who stepped up to the spot. Instead, it was the steady Andreas Brehme. He shot the ball low and to the left (right of Goycochea, see video below) and cemented Germany's title as the third team to win at least 3 World Cups. Matthaus kissed and lifted the trophy. Maradona wept in agony. For USA '94, Germany was an established team that kept its old guard (Klinsmann, Voller, Hassler, Matthaus all present) in hopes of winning once more. They had a somewhat "easy" group with Spain providing the most competition and Bolivia and Korea regarded as relative minnows. However, they found that their game had been decoded by their foes. They squeaked by Bolivia 1-0 thanks to Klinsmann. They had to come back for a tie against Spain (1-1) and, after going up 3-0 versus Korea, the Asians came back to finish the score 3-2. Germany's next opponent was Belgium, and Voller dismantled the side early in the game, but as with previous matches, the Belgians found a way to sneak back to make it 3-2 after being down 3-1. It seemed like everyone had a way to claw back at the Germans, and Bulgaria made it clear that this time Germany lacked the confidence to go the distance. After being up 1-0 thanks to a Matthaus penalty, Letchkov and Stoichkov flipped the score in their favor in a matter of three minutes. Matthaus looked shocked as he looked at the final score in disbelief. By 1998, my tastes, knowledge and appreciation of the game had changed significantly. Germany wasn't my default team to cheer for, especially considering that France was hosting and playing attractive football. 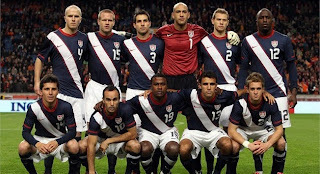 Added to that was the beginning of a long trajectory of following the US national team. Germany had it relatively "easy" in the first round, pitted against USA, Yugoslavia and Iran. Moller and an aging Klinsmann beat US 2-0, followed by a tie (2-2) versus Mijatovic's Yugoslavia, and another easy 2-0 win over Iran courtsey of Bierhoff and Klinsmann. Germany then met Mexico in a reprisal of the 1986 quarterfinal game. Even though "el Matador" Hernandez scored first for the Aztecs, it would not be enough and Germany clawed back to a 2-1 finish. Then, disaster. Against a "weaker" team. This time, it was Davor Suker's Croatia. 3-0 was the final score and the Bavarians went home early. If Beckenbauer was the coach that won the most praise in the 80s (culminating with the 1990 trophy), and Berti Vogts ruled the 90s, then the 21st century was the realm of Oliver Kahn and Michael Ballack. In 2002, the two would take Germany all the way to the final. It started with a bang... a 8-0 pummelling of Saudi Arabia. This was followed by a 1-1 tie against Ireland and a 2-0 win over Cameroon (Klose scored). The round of 16 pitted them against Chilavert's Paraguay. They won the game only after scoring in the 88th. Next came a game American fans won't soon forget. After a memorable win versus Mexico, the US had high expectations (having also defeated heavily-favored Portugal). It was not to be. 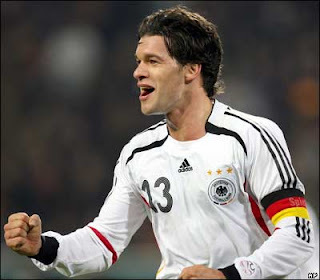 Ballack's score in the first half sealed the deal for the Germans. Ballack again proved he was a game-changer when he scored in the semifinal versus home-team Korea. 1-0 was the score and the Koreans had to settle for the 3rd place consolation match. The semifinal game was also important in that Ballack was booked and would miss the final against Brazil. This was the first time these two teams met in a World Cup. Brazil had breezed through the competition with 6 tallies by Ronaldo whilst Germany had stumbled in with gritty play and Kahn's goalie heroics (he would receive the best player award). The match always had a favorite also because of Ballack's absence. The German's attack was muted at best and Ronaldo showed his class and gained the title of top scorer (8 goals, most since 1974's Lato). Brazil won its fifth title by the score of 2-0. Germany would once again host the ecumenical tournament in 2006. Lucky for me, I was in Europe for most of the tournament and I got to enjoy it in the company of Europeans in pubs, restaurants and hotels from London to Venice. This German team, coached by the charismatic Juergen Klinsmann, was widely regarded as relatively weak. They opened against Costa Rica (first time defending champions were not automatically qualified and did not play inaugural match). It was a 4-2 score. In their second meeting, a much more worthy foe, Poland, awaited. The match was scoreless until late in the second half. A win by Germany would automatically qualify them, along with Ecuador, to the next round. In their last group match they played an Ecuadorian team that rested most of its starters ahead of their round of 16 game versus England. Germany faced Sweden in the second rounds, where two early goals from Podolski were enough to see them through. In the quarterfinals they met Argentina in a reprisal of the '86 and '90 finals. The match was tied 1-1 and Germany won on penalties. The semifinal against Italy was probably the best game of the tournament. It went 0-0 and just as we thought penalties would end up deciding the match, Grosso would score in the 119th minute, shaking his head in elation and giving us postcard moments and highlights for ESPN ads. Del Piero would seal the score two minutes later. No need for penalties. Germany won their consolation 3rd place match against Portugal. What's next for Germany? Australia, Serbia and Ghana. Look for Serbia to be the toughest opponents. Ghana and Australia are no pushovers (we're talking about Michael Essien, Tim Cahill, etc). There may be one or two surprise scores in this group but Germany should go through. Still on the radar are Pdolski (Koln), Ballack (Chelsea), Klose (B. Munich), Schweinsteiger (B. Munich), Lahm (B. Munich). Note that the majority of players are from the domestic league... this gives them more familiarity and continuity.